It's not as powerful as our larger units; but the open top design (and mar-proof feet), allow placement down low, on the floor, significantly increasing its' effectiveness against flies. It can be wall-mounted horizontally about waist high (retaining effectiveness while making it easier to service) or ceiling hung, if need be. 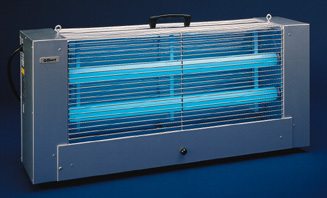 Features two, superior, Sylvania F20T12/350BL/ECO (20 watt) insect attractant lamps. Dimensions: 29" x 14" x 7 3/4"
Weight: 19 lbs., Ship Wt: 24 lbs. FIVE YEAR WARRANTY (Excluding lamps only)!